‘Rocket D.I.Y.’ is the home-recorded follow up to 2003’s ‘Kenny and Beth’s Musakal Boat Rides’. 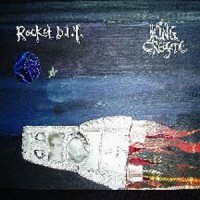 Instead of a collection of songs spanning several years, ‘Rocket D.I.Y.’ contains 12 songs, all written and recorded over a period of weeks. Acoustic guitar and piano based songs have been embellished with accordion, banjo, electronics and a smattering of samples. Collective drummers OnTheFly and Captain Geeko deliver an altogether new punch, with Pip Dylan’s pedal steel adding that final twang. ‘Rocket D.I.Y.’ can best be described as a recollection of a hectic year. From the cosmic highs to the lunar lows come world weary themes of age consciousness and humdrum household chores sitting alongside wideeyed travel adventures and far-fetched yarns. With its scratchy sentiments, anthemic yearnings and downright nonsense, ‘Rocket D.I.Y.’, like ‘Kenny and Beth’s Musakal Boat Rides’ before it, takes you on a Neukian journey possibly not as far as the stars but one you’ll want to take again.